Gracie Bowers was born in an Ozark Mountain log cabin on March 12, 1906, in Harrison, Arkansas, daughter of William L. Bowers and Lily E. Wood Bowers. Her family, which included four siblings, moved to Idaho in 1911. She quit high school at age 16 and took a job as a milk analyst for the Carnation Milk Company in Nampa, Idaho. A year later, in 1923, Gracie Bowers married John W. “Jack” Pfost (pronounced “post”), her supervisor and a master mechanic who was twice her age.2 During their long marriage, Jack Pfost remained an enduring source of support for his wife’s political career which, she admitted, was “more or less a joint venture with him.”3 The couple had no children. In 1929, Gracie Pfost graduated from the Link’s Business School in Boise, Idaho. During this time, she became involved in politics on the local level, working as a temporary replacement for the Canyon County clerk, auditor, and recorder. She ended up working full–time in this position for a decade after her predecessor resigned.4 In 1941, after losing her first bid by 1,500 votes, Pfost was elected treasurer of Canyon County, a post she held for another decade. She also served as a delegate to five consecutive Democratic National Conventions, beginning in 1944. Throughout the late 1940s and into the 1950s, she and her husband owned and operated a real estate business. When she was seated in the House in January 1953 as Idaho’s first woman in Congress, Pfost earned assignments on the Public Works, the Post Office and Civil Service, and the Interior and Insular Affairs committees. Jack Pfost worked as an unpaid assistant in his wife’s office and was her constant companion. Her assignment on Interior and Insular Affairs was a plum for a junior Member from the West because of the vast tracts of public land which fell under the panel’s jurisdiction. 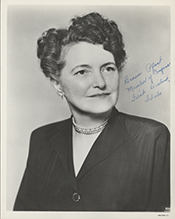 From 1955 to 1961, Gracie Pfost chaired the Interior and Insular Affairs Subcommittee on Public Lands, which had oversight of more than 450 million acres of federally managed land.9 She first attracted national attention as a member of the Select Committee to Investigate Tax–Exempt Foundations, which probed the finances of such philanthropic organizations as the Ford Foundation and the Fund for the Republic, to determine if grants were distributed for “un–American” activities. On May 24, 1954, Pfost and Wayne Hays of Ohio walked out of the hearings and accused the committee of permitting unreliable testimony against foundation employees and failing to require witnesses to submit prepared statements or digests of testimony prior to their appearances. As a result of their withdrawal, the committee voted in July to end its hearings. Pfost dissented from the final committee report, which concluded that several foundations had unwittingly subsidized subversive ventures. With Jack Pfost’s sudden death in 1961, Gracie Pfost lost not only her husband, but her closest political confidant. In 1962, when Idaho Senator Henry C. Dworshak died, Pfost chose to leave her safe House seat to run as the Democratic candidate in the fall election to fill the remainder of Dworshak’s unexpired term. Pfost ran against former Governor Len B. Jordan, a Boise rancher who had been appointed three months earlier by Idaho’s GOP governor to an interim position in the Senate. Pfost lost narrowly by only 4,881 votes (51 to 49 percent), failing to carry her home county of Canyon. After her political defeat, she was appointed Special Assistant for Elderly Housing at the Federal Housing Administration (FHA). Gracie Pfost, suffering for several years from Hodgkin’s disease, served at the FHA until she died at age 59 on August 11, 1965, at Johns Hopkins Hospital in Baltimore, Maryland. 1“Rep. Pfost Speaks: ‘Hell’s Belle’ Gives the GOP Likewise,” 19 May 1953, Washington Post: 23. 2Karen Bossick, “Idaho’s First Woman in Congress; Gracie Pfost Took Humanitarian Attitude from Nampa to D.C.,” 25 July 1999, Idaho Statesman: 1E. 3Hope Chamberlin, A Minority of Members: Women in the U.S. Congress (New York: Praeger, 1976): 230. 6Mary Van Rensselaer Thayer, “Gracie and Louise Will Battle to Finish in Hills of Idaho,” 1 July 1956, Washington Post: F11; Georgette Ross Howard, “Gracie Pfost Never Forgets Idaho,” 17 September 1954, Christian Science Monitor: 8; Congressional Record, House, 84th Cong., 1st sess. (11 May 1955): 6182–6183, reprint of article by Anne Cottrell Free, “Petticoats in Our Government—Representative Gracie Pfost Tagged ‘Hell’s Belle’ as She Fights for Dam at Hells Canyon,” publication and date are unidentified. 7“Gracie Pfost Dies; Idaho Democrat,” 12 August 1965, New York Times: 27. 9Despite a high level of satisfaction among Members serving on the Interior and Insular Affairs Committee (due in great part to a good record of securing legislation originating in the committee), turnover was not uncommon. Some Members, most especially those not from the West, viewed it as a short–term committee assignment, which could explain why Pfost was able to rise through the ranks to chair a subcommittee so quickly. Richard F. Fenno, Jr., Congressmen in Committees (Boston: Little, Brown, and Company, 1973): 274–275. 12“Rep. Gracie Pfost Wins Easily in Idaho,” 8 June 1960, Washington Post: A2; “Elections Statistics, 1920 to Present,” http://clerk.house.gov/member_info/election.aspx. 13Susan Tolchin, “Women In Congress” (Washington, D.C.: Government Printing Office, 1976): 63. 14William H. Chafe, “The Unfinished Journey: America Since World War II” (New York: Oxford, 2003): 139. 15Congressional Record, House, 83rd Cong., 1st sess. (3 August 1953): A5233–5235; Congressional Record, House, 83rd Cong., 1st sess. (16 April 1953): 3232–3235; Congressional Record, House, 84th Cong., 1st sess. (8 March 1955): 2530–2537. 16Congressional Record, House, 83rd Cong., 2nd sess. (14 April 1954): 5181–5184. 17Congressional Record, House, 84th Cong., 2nd sess. (6 June 1956): 9709. 18“House Unit Kills Hells Canyon Bid: Blocks Pfost Bill for Federal Dam,” 25 July 1957, New York Times: 1, 10; see also, Congressional Record, House, 85th Cong., 1st sess. (29 April 1957): 6130–6133. 19Bossick, “Idaho’s First Woman in Congress”; Congressional Record, House, 85th Cong., 2nd sess. (26 May 1958): 9510–9511. 20Congressional Record, House, 85th Cong., 1st sess. ( 22 July 1957): 12348; Congressional Record, House, 84th Cong., 1st sess. (31 March 1955): 4155. 21Congressional Record, House, 84th Cong., 2nd sess. (29 June 1956): 11465. 22Congressional Record, House, 84th Cong., 2nd sess. (11 April 1956): 6154–6156; Congressional Record, House, 84th Cong., 2nd sess. (9 April 1956): 5955. 23Marie Smith, “Gracie Pfost Sets Bonnet for Seat in the Senate,” 3 August 1962, Washington Post: C5. 24Congressional Record, House, 87th Cong., 1st sess. (20 July 1961): 13122; Congressional Record, House, 84th Cong., 2nd sess. (20 February 1956): 2922–2923. Papers: 1950-1962, 61 cubic feet. The papers of Gracie Pfost contain administrative records including inter-office memoranda and procedure statements, constituent correspondence, personal correspondence, records of committees, bills sponsored, speeches, news releases, and audio tapes of radio talks. A finding aid is available in the repository. Papers: 1940-1962, 4.5 cubic feet. The papers of Gracie Pfost contain personal and congressional papers, and correspondence. A finding aid is available in the repository. Papers: 1958-1973, 14 items. The papers contain articles, photos and congressional registers about Congresswoman Gracie Post. Papers: In the Pluma Burroughs Penton Batten Papers, ca. 1948-1964, 5.25 linear feet. Subjects include Gracie Bowers Pfost. "Gracie Bowers Pfost" in Women in Congress, 1917-2006. Prepared under the direction of the Committee on House Administration by the Office of History & Preservation, U.S. House of Representatives. Washington: Government Printing Office, 2006.